Principality Stadium chief executive Martyn Phillips would relish the chance to host an Anthony Joshua bout at the 74,500 capacity Cardiff venue. 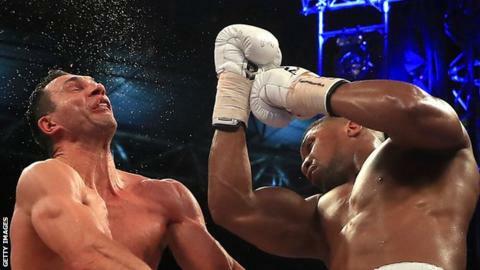 Joshua knocked out Wladimir Klitschko to add the WBA world heavyweight title to his IBF crown at Wembley Stadium last weekend. Afterwards the Englishman was hailed as "the biggest sports star in Britain". "Nothing would make us happier than having a Joshua fight at some point," Phillips told BBC Radio Wales Sport. Phillips says the stadium's roof - the only one of its kind in the United Kingdom - ensures the home of Welsh rugby can be used at anytime. "The stadium is an asset that we want to use," he continued. "When we're not playing rugby on it, we want to use it as much as we can so we've sort of driven that quite hard this year with concerts." Speedway, rugby league, football and boxing have all taken centre stage there and Phillips says talks are continuing with NFL chiefs over the possibility of hosting American Football. Joshua's stunning win over Klitschko added to his appeal and Tyson Fury has accepted the prospect of an all-British title bout. Phillips, the joint stadium and Welsh Rugby Union chief executive, added: "We're in conversations with various boxing promoters. "Obviously the roof - we are the only big stadium with a roof - and it's been done before, obviously, with Calzaghe and so on, previously. "So nothing would make us happier than having a Joshua fight at some point."